Musings of a Durotrigan: Reform Section 5: why is the BBC silent? 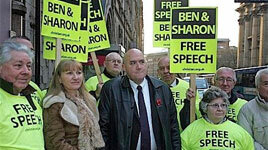 The Reform Section 5 Campaign with its slogan ‘Feel free to insult me!’ was formally launched by Rowan Atkinson last week, but for some reason did not appear to receive any coverage from the BBC, or not at least from its website. Why did it choose not to cover this story? After all, since its introduction Section 5 has placed considerable limitations upon freedom of speech and expression and has led to the prosecution of a number of people for no good reason at all. Being a public service broadcaster which, one would think, ought to be interested in championing free expression, why was it silent? "The clear problem of the outlawing of insult is that too many things can be interpreted as such," said Atkinson. "Criticism, ridicule, sarcasm, merely stating an alternative point of view to the orthodoxy, can be interpreted as insult." Section 5 is part of the Public Order Act 1986, which outlaws the use of words, behaviour or signs that are "threatening, abusive or insulting" near a person likely to be offended by them. Indeed, the Reform Section 5 website details a number of cases illustrating the absurdity of the law. 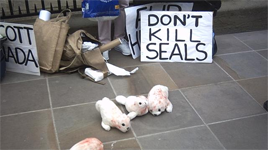 Three of these case summaries are reproduced below detailing respectively: a man convicted for growling at two Labradors; Christian hoteliers who talked to a guest about Mohammed and Islamic dress codes, and animal rights protesters who were moved on by police because their cuddly toy seals were deemed to be ‘distressing. Are we then to take it that the BBC’s silence on Reform Section 5 indicates its opposition to the campaign? This would not, given the tightly controlled and stiflingly politically correct broadcasting of the corporation come as any surprise, for genuine freedom of speech and expression is not something that the BBC favours; it prefers, to borrow an ugly term from the New Labour era, for its presenters and editors to be consistently ‘on-message’, which means not upsetting its pet minority groups such as, most notably, Muslims. Nonetheless, Reform Section 5 does seem to enjoy a broad spectrum of support, with a number of pressure groups, think tanks and politicians lending their backing to the campaign, as well as a number of celebrities, including Stephen Fry. Organisations as different in their orientation as the Christian Institute and the National Secular Society have united in their wholehearted backing of the project, but despite their vociferousness and willingness to demonstrate over a number of issues relating to freedom of speech and expression (or, more accurately, in favour of their curtailment), no Muslim organisations have declared their backing for the campaign. The breadth of likely support in the House of Commons is illustrated by an amendment to Section 5 of the Public Order Act tabled by MP Edward Leigh in May 2011, which proposed that the word “insulting” be deleted. Although he managed to garner the support of 65 MPs (31 Conservative, 14 Labour, 11 Liberal Democrat, 6 DUP, 1 Alliance, 1 Green and 1 SDLP), it was not successful. Evidently, a little more pressure needs to be applied to MPs for this campaign to achieve its goals, but there do appear to be grounds for optimism that Section 5 will be dropped, but without of course, any help from the BBC. The video below shows Rowan Atkinson giving his speech at the parliamentary reception launching the Reform Section 5 Campaign. I am aware of this. It possesses a certain myopia and deeply ingrained flaws. Why? Because the initiators are not willing to modernise and face reality. I don't know who they are but if its like the usual radical nationalist party it will be run by people who operated previous radical nationalist movements. That means they will be people who have failed previously and while their colleagues will acclaim them as having experience in reality they only have experience as political failures. The article does not even reveal their name.